Another key component to the intercooler system is our computer designed intercooler piping. This features acarbon fiber Y-pipe offering 40% more flow. The larger 2.5″ diameter is significantly wider than stock (1.79″) and has a gloss finish to provide lasting durability. The Y pipe is a custom designed carbon fiber piece, conforming to the tight surroundings of the engine bay and the inner walls of the pipe promote the flow of charged air to the intake with minimal amounts of turbulence. To further improve airflow, our engineering team went a step further by computer designing precisely molded, custom silicone couplers. These provide perfect fitment and optimized geometry for improved airflow volume and velocity providing a 30 HP gain and quicker boost response helping you stay ahead of your competition! 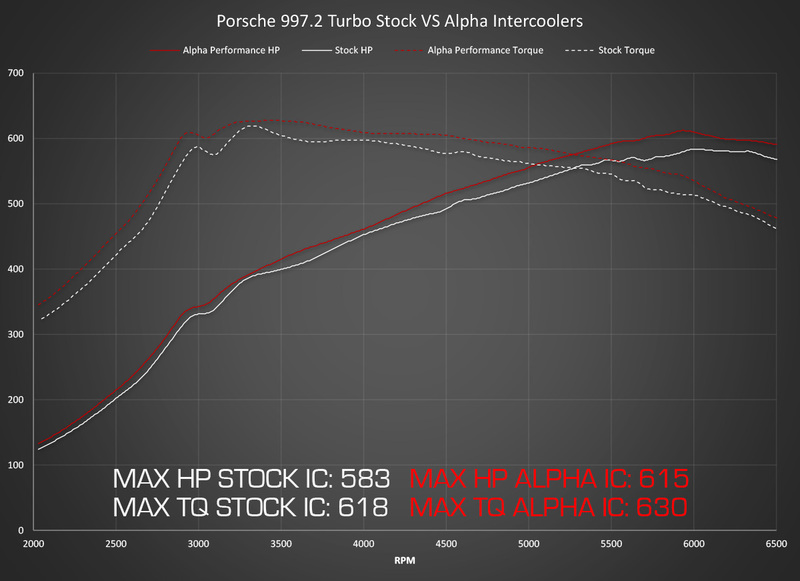 Perhaps the best feature about this intercooler system is that it maintains cooling efficiency as more power producing upgrades are added to your Porsche 997.2TT! It improves the effectiveness of your other upgrades giving you maximum hp output potential! 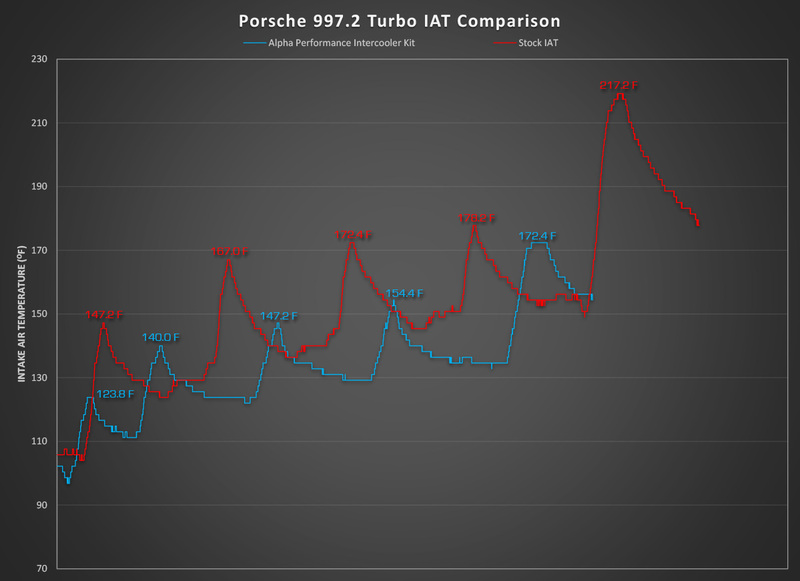 Note: our test 997.2 Turbo was was equipped with an aftermarket exhaust and Alpha Tune prior to this test. The dyno above reflects a pull with the stock intercoolers, then installing our Alpha Intercooler System and doing another pull. There were no changes to the tune or any other components.